A weird way in which transport has influenced culture (in its widest sense) is in its contribution to mythology, that collection of stories that swirl around us, reflecting our hopes, dreams and fears, to be told and retold until the grain of truth that gave rise to them has been long since forgotten. In the case of transport, it’s mostly railways that have fed into folklore, and for some reason mostly on the ‘fears’ side. There’s just something about railways, and railway tunnels in particular (as you’ll see below), that lends itself to the creation of slightly spooky stories. I’m not aware of any urban myths about trams or buses (except this one, and I can’t find any references to it earlier than 2011), but if you know one, do tell me. First up is the legend of the UK Strategic Steam Reserve. During the cold war, it became obvious that the effect of a nuclear attack would potentially ruin much electronic equipment. This would render modern diesel and electric locomotives useless, so how to transport vital supplies around the country in the nuclear winter which would follow? The answer would be to use steam locomotives, and so the UK government was alleged to have spirited away a fleet of steam locomotives which were otherwise due to be scrapped, and secreted them underground somewhere. They could then be brought back into service in the aftermath of the nuclear bombs falling. Always assuming the railway tracks hadn’t melted. And that there was any population left who would actually need vital supplies. The Strategic Steam Reserve is a story so enduringly popular that BBC Radio 4 investigated it as part of its “Punt PI” series (as you can see here). Presenter Steve Punt found no evidence of the Reserve, I’m afraid. All the steam locomotives which were intended to have been scrapped by British Railways are accounted for – there are none that went missing. But of course if there was such a thing as a Strategic Steam Reserve, the government would have made sure there was a perfectly convincing set of records to show why there wasn’t one. But even the believers in the Reserve seem to agree that the locomotives must have been scrapped by now. 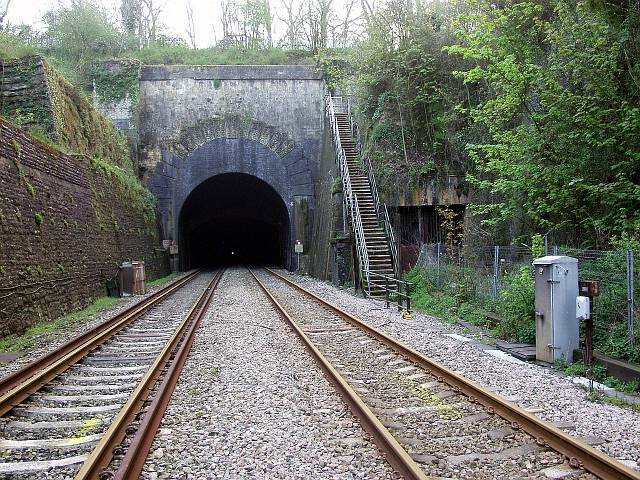 A number of locations were suggested as hiding places for the Strategic Steam Reserve, amongst them abandoned tunnels in the Cheltenham area, but probably the most popular supposed location for the Reserve was at Box Tunnel in Wiltshire. I’ll look at Box Tunnel’s dramatic western portal another time, but at the east end of the tunnel, and just to the north of the railway line, there is a secondary tunnel mouth, now very overgrown, a bit mysterious-looking, and obviously (at least to conspiracy theorists) up to something. The tunnel leading into the hill from that secondary tunnel mouth is sometimes said to be the erstwhile hiding place for the Strategic Steam Reserve, while at other times it is said to be the location of the terminus for a perhaps mythical railway service. And so we come to our next urban myth, that of the Last Train. During the Cold War, in the event of actual nuclear war, the UK government would have had to evacuate London and move to an underground bunker to carry out its operations (or at least whatever operations would be needed in the event of nuclear war, so I assume that the government department overseeing tourism probably wouldn’t have had much of a role). That bunker was in Corsham, Wiltshire, buried in the hill above Box Tunnel. It is believed by many that with enemy nuclear bombers heading for London, the government would have rushed to Paddington station in west London, jumped on a special “Last Train” and headed for Corsham, with the train running into that mysterious secondary tunnel just to the north of Box Tunnel’s main portal. And that would be the last the passengers on the Last Train would see of daylight for months. That secondary tunnel at Box was originally built in the 1880s to serve Randell & Saunders’ Tunnel Quarry (one of a number of quarries in the hill above Box Tunnel) for the extraction of excellent building material Bath Stone. It was a small tunnel in those days with a narrow gauge tramway running out from the quarry galleries, through the tunnel and on to Corsham station (which closed in the 1960s). In the lead up to the second world war, Tunnel Quarry was converted for use as the Central Ammunition Depot. The tramway line was upgraded to standard gauge and connected directly to the main line to facilitate ammunition trains picking up and dropping off armaments. To facilitate this, the tunnel was enlarged to take full size trains. This underground siding ran for half a mile, and a goods station was built within the tunnel. Photos of the underground station within Tunnel Quarry can be found here. And it is alleged by some that after the second world war, with the Cold War in full swing, the station was linked directly to the government’s new underground bunker via Tunnel Quarry, and made ready to receive the government on the Last Train at a moment’s notice. It’s certainly true that the Corsham quarries were the site of the UK government’s underground bunker “Burlington”, the existence of which was declassified in 2004 when the BBC and others were invited to have a look round. But Burlington was in Spring Quarry, on the south side of Box Tunnel rather than the north where Tunnel Quarry is, and there seems to be some disagreement about whether the two quarries were actually linked directly to each other in the Cold War period. If they weren’t, the Last Train would have been jolly inconvenient because the government would have had to get out at Tunnel Quarry station, go up to the surface and then go back down into the Burlington bunker within Spring Quarry. This latter part of the journey from the surface to the bunker they would have undertaken on an escalator which was requisitioned from London Underground’s Holborn station (and that bit is true). All this is terribly exciting in a nihilistic sort of way, but sadly eminent Cold War historian Peter Hennessy says the Last Train from Paddington station was a myth (it would have had to out-run the bombs, for a start, I suppose). His research (in his excellent if terrifying book The Secret State) suggests that the civil servants who would have staffed Burlington would have assembled at Kensington Olympia station in west London once the situation looked irretrievable, then caught a special train to Warminster, from where they would be transported by lorries to Burlington’s surface entrances. The Last Train was sort of real then, but it wouldn’t have run to the Tunnel Quarry station, and neither would it have been a last minute express dash. On a rather smaller scale than the Strategic Steam Reserve, the tantalising idea of lost/buried locomotives is also to be found in the story of the steam locomotive which is said to be buried under the pitch at Wembley Stadium. The general feeling is that it’s a narrow-gauge locomotive which fell into a pit (how careless) during the demolition of what was supposed to be England’s answer to Paris’s Eiffel Tower. The brainchild of Metropolitan Railway chairman Sir Edward Watkin, what became known as Watkin’s Folly never rose higher than its legs. The site was then used for the Empire Stadium, later better-known as Wembley stadium, with the Folly’s foundations and the steam locomotive simply covered over with earth and the pitch built on top. Antony Clayton, author of The Folklore of London (a book about curious London traditions and myths) is highly sceptical of the legend, and when Wembley Stadium was reconstructed in the early 2000s, no locomotive was found, although the foundations of the Folly apparently were. But believers in the existence of the buried locomotive say that just shows the builders didn’t look properly. Inhumation is also the subject of our final urban myth, which holds that a horse and cart belonging to builder Robert McAlpine fell into one of the piers of the Glenfinnan Viaduct in the west Highlands of Scotland, during construction in 1899, and that it has remained there ever since. And amazingly, that story is actually true…sort of. No such horse and cart could be found when the Glenfinnan viaduct was examined in 1987 by Professor Roland Paxton (professor in the School of the Built Environment at Heriot-Watt University in Edinburgh). But the professor was then told by a local that the story actually related to one of the piers of the Loch nan Uamh viaduct, a little further west along the line. Although initial investigations with a camera could show only that the pier in question was full of rubble, a subsequent radar examination in 2001 imaged the horse and cart, buried vertically in the pier. 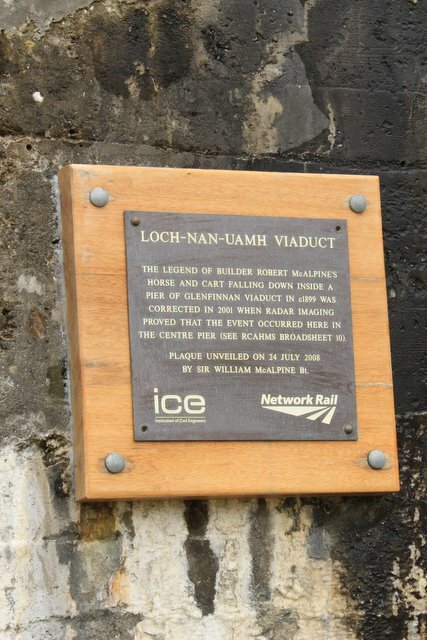 So Network Rail and the Institute of Civil Engineers erected a plaque (unveiled by Sir William McAlpine in July 2008) to commemorate both the original accident and the rediscovery of the accident site, to considerable local pride. Well done them. The plaque at Loch-nan-Uamh. © Copyright edward mcmaihin and licensed for reuse under this Creative Commons Licence. From geograph.org.uk, here. It only goes to show that even the tallest of stories sometimes relate to something true. In which case, has anyone checked absolutely all the bricked up railway tunnels for a store of mothballed steam locomotives…just in case? This is brilliant. Never heard of any of these, and marvelously told. Thank you! I would make exactly the same comment about many of your articles. Re, A West Highland Legend, note that the university in Edinburgh is actually Heriot-Watt. Thank you – typo now corrected. The Strategic Reserve is just a myth, there is no such thing, all locos from the mass 1960’s scrappings have been accounted for. The side bit of Box tunnel contains an abandoned narrow gauge line for an ex mod depot and has appeared in the Railway press in recent years. The tunnel is too low to support large standard gauge steam locos.